Not major but thought I would log it nonetheless. 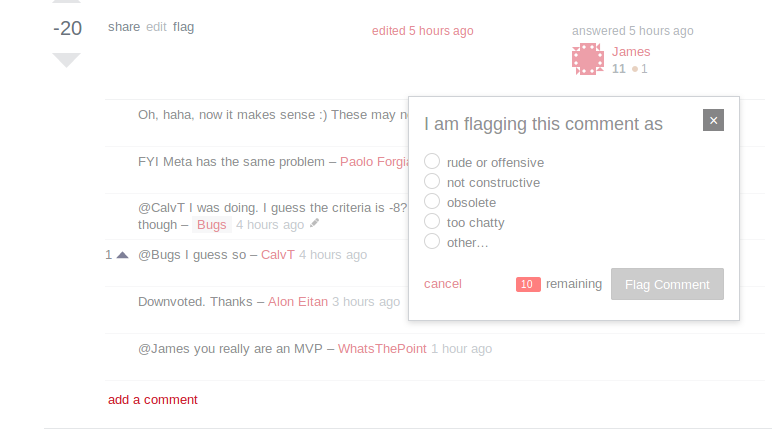 Whilst flagging a comment on a shaded answer (by shaded I mean it has a negative score of 3 or more) the popup appeared in front of another shaded answer. At this point the popup looks OK but if you happened to move the mouse over the other shaded answer the popup starts to flicker and looks a little unstable. As you can see it's not exactly a clear popup, instead it's see through. This is on Chrome version 58.0.3029.110 (64-bit). On IE 11 it looks fine. I haven't got Firefox to test. For reference this is the comment I was flagging. I haven't flagged as I'd like to provide an example for repro. 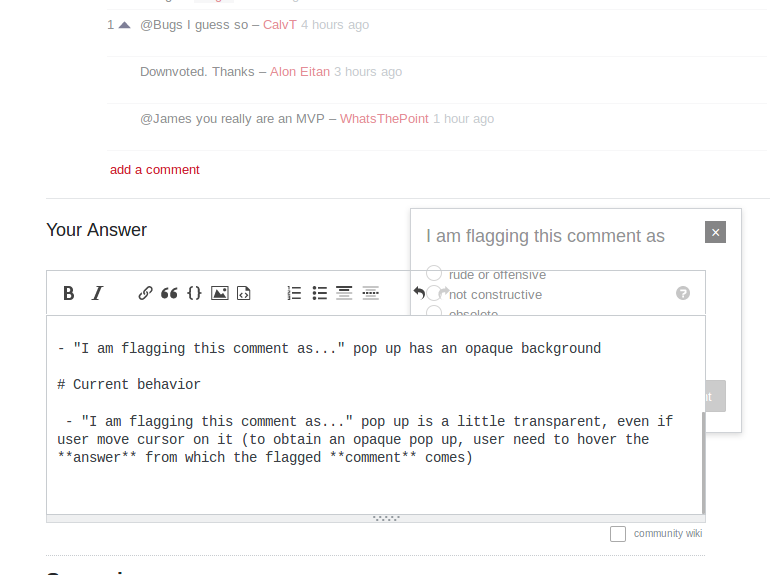 "I am flagging this comment as..." pop up is sent to a z-index < to the "Your Answer" one. I don't think chrome likes background-color being #FFF maybe changing it to the standard #FFFFFF will fix this..... also making sure semicolons at the end of css code lines helps the class work properly too. In my fixed code offering above, I made the background-color the same hex color scheme as everywhere else in the css code, and added a semicolon at the end of the border style. Saving others a click, down vote this answer. Not the answer you're looking for? 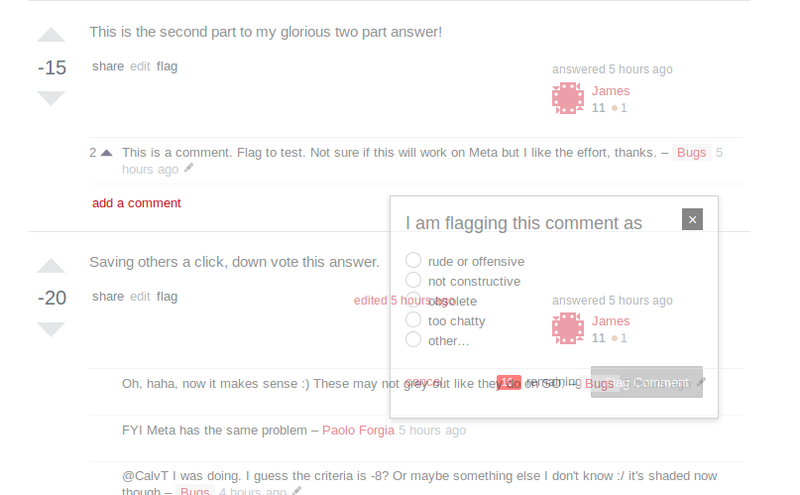 Browse other questions tagged bug design comment-flags . 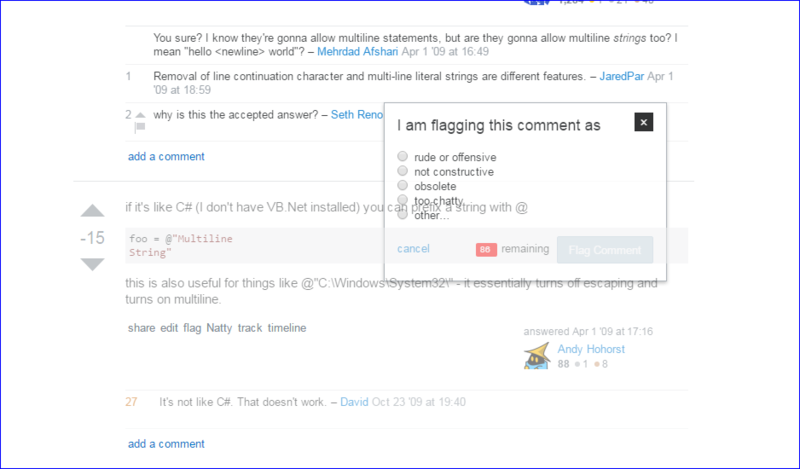 Comment flagging limit reached, but dialog still appears?